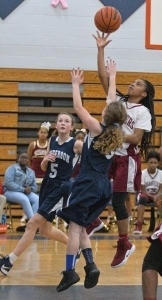 Without Defending DCSD Middle School basketball champions Chapel Hill (girls) and Renfroe (boys), the 2019 DCSD Middle School Basketball Championships are set to crown new champions on Saturday at Cedar Grove Middle School. The girls’ championship pits the Champion Lady Chargers (15-1) and the Stephenson Lady Jaguars (15-1) who tied for the Region 2 championship. Champion won the coin toss for the No. 1 seed heading into the tournament. Stephenson won the first of the two regular season matchups 24-16 in November and Champion bounced back with a 36-35 victory in December to even things up. Stephenson got the best of the Tucker Lady Tigers 37-29 in the semifinals with an overall great defensive effort as a team. Tucker’s Malaya Jones did most of the damage for the Lady Tigers hitting for 19 points in the game. Champion’s semifinal game went to overtime with the Lady Chargers pulling out a 38-37 victory over the Henderson Lady Cougars. Myori Pruitt hit for 14 points and teammates Jayla Thomas with 13 and Aliyah Ismael 11 joined her in double figures. The two Region 2 co-champions will play one last time this season as they clash in the girls’ championship game at 5:00 pm on Saturday. The consolation round opens at 2:00 pm as the Henderson Lady Cougars (12-3) and Tucker Lady Tigers (11-5) meet for third time this season as they go for the third place trophy. Henderson won both regular season meetings by scores of 23-18 and 40-18. The 16-0 Stephenson Jaguars look to finish off a perfect season as they face the Salem Lions (15-1) at 6:30 pm. The two top seeded teams in the tournament did not play in the regular season. Salem’s only loss of the season came on the opening week falling 38-28 to Cedar Grove. The Jaguars, the Region 2 champs, knocked off Region 1 champion Tucker (13-3) 38-32 in a hard fought semifinal. Christian King hit for 13 points and Eduardo Hendricks added 10 in the win. Salem has won 15 consecutive games since the season opening loss and moved into the championship game with a 39-31 victory over Region 2 runner-up Druid Hills (11-4). The boys’ consolation between Tucker and Druid Hills is set for a 3:30 pm start at Cedar Grove Middle School. Druid Hills won the regular season matchup 33-25 over the Tigers. First team listed is home team.